The database is accessible to standard/corporate members only. Click here to upgrade your membership or know the premium benefits. You are welcome to apply for a 14-day free trail to take a glance at the database. Our regulatory database is a repository of information providing you with easy access to need-to-know compliance information. The database encompasses a broad range of relevant industries providing both concise summaries and detailed explanations, along with insightful perspectives and analysis from our regulatory experts. 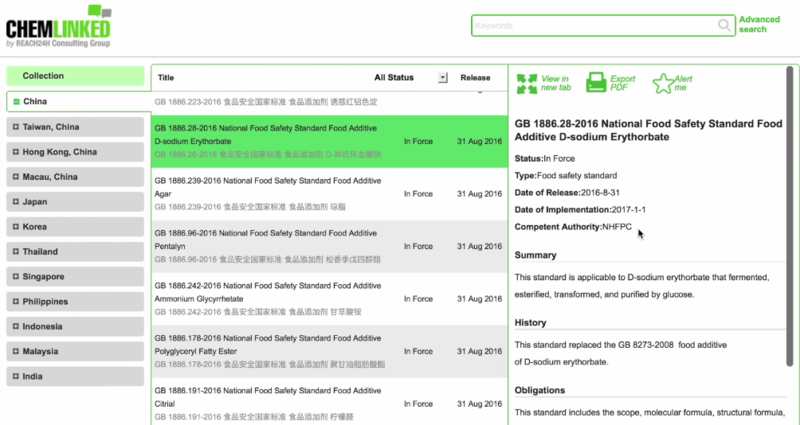 Currently, the regulatory database covers a wide range of topics, including China New Chemical, Hazchem, Taiwan TCSCA, Japan CSCL, Korea REACH, Thailand Hazchem, Asia Pacific GHS, etc..
We recommend you to use the IE 8.0+, Google Chrome, Firefox and Safari.